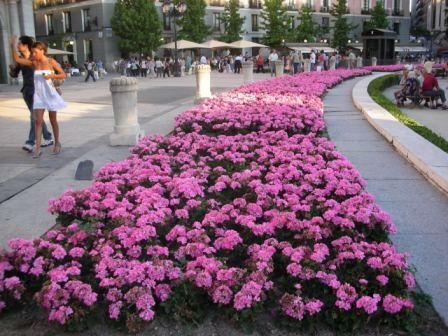 Visit Madrid if you like art, museums and history. Having at least 30 important museums, art and culture are key to a visit to Madrid. However, the capital of Spain also has lots to offer to non-art lovers, such as history, religion, grand architecture, shopping and football! Having been named 'the best club in the history of football' by FIFA in 1998, a trip to the Bernabeu stadium, home to Real Madrid, is a must for football fanatics. As the saying goes, Madrid's climate is 'Nueve meses de invierno, tres meses de infierno' (nine months of winter, three months of hell), so be prepared for hot and stuffy weather if you are visiting in the summer months. The national symbol of Madrid is "El Oso y El Madroño" (Bear and the (El Madroño) Tree). A statue of the symbol is located in Puerta del Sol (see picture to right). Click here for more information. 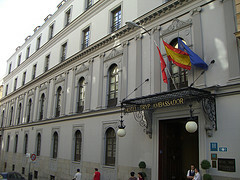 The 250 year old palace is now only used for state occasions as the Royal Family prefer to live in the Zarzuela palace. Join a 45 minute tour in English or Spanish. Don't miss the Royal Pharmacy or the Royal Armoury! Opposite the Royal Palace, Madrid's most important church is dedicated to the Virgin of Almudena. Popular for its colourful interior and modern beauty, a trip to the Cathedral also offers great views over the Royal Palace. Dominated by the equestrian statue of Felipe III and the Casa de la Panadería with its naked murals, la Plaza Mayor is a fantastic meeting place. Filled with cafes, it is a great square to have some tapas and watch the world go by (but don't expect it to be cheap!) There is a stamp and coin market on a Sunday and concerts and plays in the Summer. Visit this 16th century convent which houses the Descalzas Reales (Barefoot Royal Sisters), nuns who originated from nobility. It is advisable to visit early in the day to book a tour as numbers are limited. Free on Wed to EU citizens. Closed on Mon (all day) and Fri (pm). The Prado has organised three routes for visitors to focus on its masterpieces, featuring major European art such as The Annunciation by Fra Angelico, Christ washing the Disciples’ Feet by Tintoretto, The Descent from the Cross by Rogier van der Weyden and The Three Graces by Rubens. Click here to buy your ticket in advance and avoid queuing on the day. Located just off c/Arenal and close to Plaza Mayor, Chocolatería San Gines first opened in 1894 and still pulls in the tourists due to its famous 'chocolate con churros/porras' (thick, rich hot chocolate with sticks of fried dough - see photo to the right). Open all the time, visit Chocolatería San Gines to share in a traditional Madrileñan experience! One of the largest buildings in Europe contains Spain's national museum of modern art including Guernica by Picasso. Free entry on: Sat 14.30 - 21.00; Sun 10.00 - 14.30. Normal entry charge is 6 euros. Reduced entry is 3 euros (see conditions here). The Templo de Debod once stood in the Nile Valley of Egypt but was brought to Madrid in 1971. It isdedicated to the god Amon and the goddess Isis. The park surrounding the temple offers great views over Madrid and is the best place to watch the sunset. Take a tour of the Santiago Bernabéu Stadium, including the trophy room, dressing room and players tunnel. General adult price is 15 euros. Open every day apart from 25th Dec and 1st Jan. Click here to buy Real Madrid merchandise. Madrid, Spain, is dynamic and enchanting! Find out exactly why as a native shows you the city with what the guidebooks have and what they don`t include! View Larger Map (To see the Bernabéu stadium, click on 'View Larger Map' and scroll north). 1) Walking. As you can see on the map, all of our top 10 sights (apart from the Bernabéu stadium) are based in central Madrid and are within walking distance. If you plan your days by area, Madrid is easily walkable so grab yourself a great guide book (see my favourites to the right) and get walking! IMPORTANT: Wear comfortable shoes and take blister plasters with you! 2) The Metro. If your hotel is near Plaza España (near Templo Debod), but your first visit for the day is El Prado, we would advise you take the Metro. Much as it is great fun to walk along Gran Vía looking at the different musicals available, the colourful shops and the varying styles of architecture, after 3 days of walking EVERYWHERE in Madrid, my legs were very tired. Any decent guide book should have a metro map but if not, click here. 1 journey is 1€ (tickets can be bought at the metro stations) or you can get a 1 day Tourist Travel pass for 5,20€.. ADVANTAGE: Cheap and quick way to travel. DISADVANTAGE: Whilst you're underground, you're not seeing Madrid. 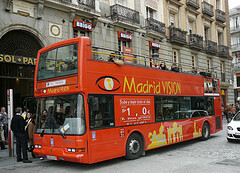 3) Madrid Vision Bus. Based on two routes, Modern Madrid and Historical Madrid, you can jump on and off the bus whenever you please. Click here to benefit from online discounts. Note also that if you have purchased the MADRID CARD, journeys on the Madrid Vision Bus are included in the price. ADVANTAGE: No planning needed, just jump on the bus and see the most famous sites. DISADVANTAGE: No independence. 4) By Bicycle. Bravo Bike's Madrid cycling tours offer a variety of routes: Madrid City Bike Tour; Madrid and Nature; Madrid Full Day; Bike and Wellness; and Crazy about Soccer. Prices range from 25€ to 55€. Alternatively you can hire a bicycle and tour Madrid for yourself. Click here for full details. ADVANTAGE: Quicker than walking. DISADVANTAGE: Some routes may be more difficult by bicycle than on foot. 5) By Segway. Starting at 10h00 or 16h00, joing a Segway tour for a 3 hour glide through Plaza Mayor, Royal Opera, Templo Debod, Plaza de España and the Palace amongst others. The cost of € 60 per person is quite pricey but does include food and a CD of your trip. Click here for more details. ADVANTAGE: Save your legs! DISADVANTAGE: Expensive. Generally speaking, if you stay anywhere in central Madrid as long as you are near a metro station, you are near to the main sights. Check the metro plan before you book. As a personal preference being around the Plaza Mayor area is the best as you will be quite central and there are plenty of restaurants and bars around that area. 1) Vincci Via 66: When visiting Madrid in summer 2008 we were lucky enough to get a cheap late deal at Vincci Via 66 on Gran Via. Whilst a little more north than I would have liked to be, the hotel was a 4 star with a contemporary design, spacious rooms and fantastic bathroom. If you can get a cheap deal or it is a special occasion, this place is really quite special. 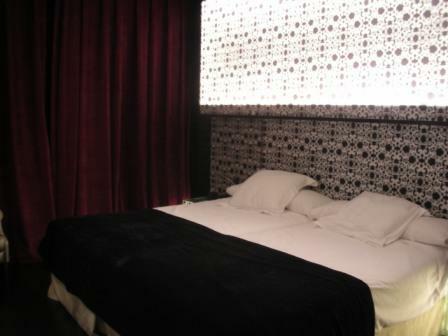 2) Tryp Ambassador Hotel: On a business trip to Madrid last year we stayed in the Tryp Ambassador Hotel. Again a four star hotel and very luxurious - this is nearer to the main sights than Vincci Via 66 but not quite as exuberant. 1) Chocolatería San Gines: as one of the Top 10 sights of Madrid, experiencing chocolate con churros here (or even an horchata) is a must. 2) Cafés near the Palacio Real (Royal Palace): with a very glamorous backdrop, it is only right that these cafés should be pricey. However, sipping an ice cold drink whilst being shaded by umbrellas and misted to keep you cool makes the whole experience quite regal! See photo to the right. 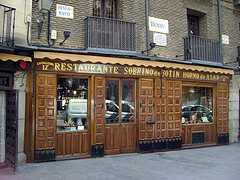 3) Botín: According to the Guinness Book of Records, this is the oldest restaurant business in the world. Near Plaza Mayor, this atmospheric restaurant offers traditional madrileñan cuisine, but a reservation is recommended. 4) Los Galayos: This restaurant on Plaza Mayor has been going since 1894 and is still offering great tapas. Always busy, you may need to book for the dining area, though we managed to perch in the wooden bar area and enjoy some sumptious tapas! 5) Plaza Mayor: Number 2 on the Top 10 sights list, Plaza Mayor is crammed with cafés but don't settle for the first one you see - wander down the streets leading from each corner as well to get yourself the best deal. 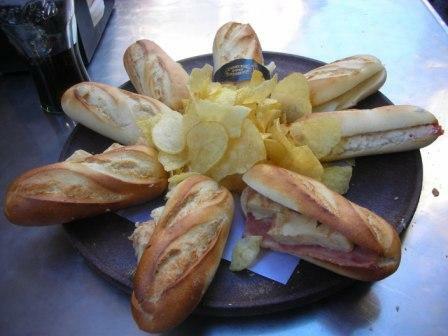 6) Cervecería 100 montaditos: A sandwich chain in Spain, this place is fantastic! Simply tick which mini sandwiches you require on the menu and take inside to the bar! Each sandwich is about 1€ so you can order plenty! Very popular so you may need to queue but you won't be waiting long and it is worth the wait! 7) Topolino's: An Italian chain in Madrid, Topolino's might not be an obvious choice, but if you want a change from tapas or if you have kids, visit Topolino's for a varied and cheap menu. Choose a particular meal from the menu (pasta/burger, etc.) or take advantage of the buffet deal. 8) Flamenco bar: Near Plaza Mayor. For a full guide to eating in Madrid, click here. 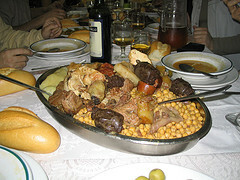 1) Cocido madrileño - classic Madrid stew.